…. if you just ask, they will give you one. Some stores have caught on to my little scheme and they will sell it to you for around $5. 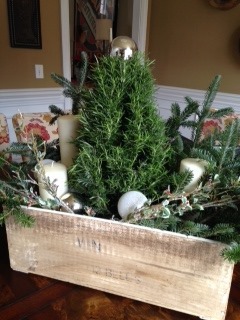 I got mine for free and here’s what I did to make it worthy of a holiday centerpiece. 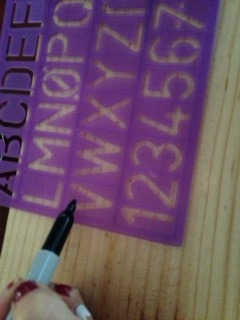 First, grab a sharpie and some letter stencils. Some crates are only marked on one side. Stencil some fun things on the other sides such as the wine name or the number of bottles in the crate, etc. 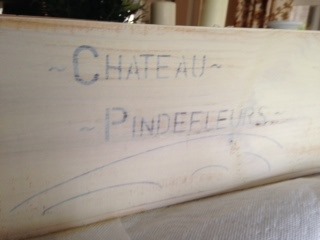 Then, grab your favorite chalk paint and water it down. I used ASCP in Cream. Swipe some watery chalk paint all over. You will see that your sharpie lettering will show through. Then sand lightly over your crate. There may be some rough parts. Remember, these were made for utility, not aesthetics. 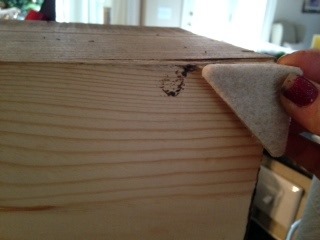 Depending on how you want your crate to turn out, sand the rough spots down or leave them rough. I left mine rough. I applied Annie Sloan dark wax and it really caught the rough spots and stuck. My crate came out darker than I thought, but it works. Make sure to apply felt pads to the bottom. Remember that whole utility part about these crates? Well, sometimes there are rough spots and nails and staples sticking out of these things. Don’t let them wreck your furniture. 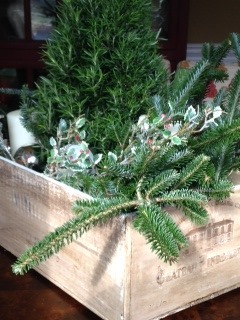 Then fill the box with your favorite greens. 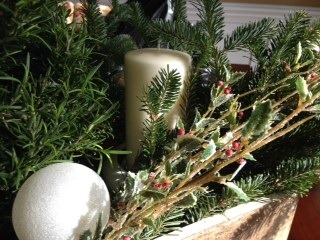 Mine is filled with a rosemary tree (purchased at Lowes), some branches from a friends tree (thanks, Angela! ), some candles (don’t light them!! fire hazard! ), and some ornaments. It now sits in the center of my dining room table. Just found your blog.. love it! 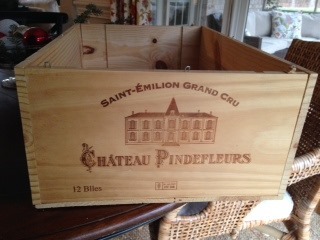 Also love the wine crate.. where did you get yours? 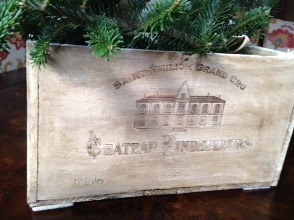 It’s EXACTLY what I’ve been looking for in front of my fireplace! Yay! Thanks! I got it at Total Wine in Birkdale.